Before looking ahead, I always like to review the actual results from the prior month. After all, what fun would it be if we didn’t follow-up on the results? We predicted 5 companies would increase their dividend in September! Company #1: Lockheed Martin (LMT) – Let’s start this month’s summary off with a bang. LMT announced a very solid 10% increase in their dividend. This is right in line with their five-year average. I’m sure Lanny is pumped considering he owns a healthy position in LMT! Company #2: McDonalds Corporation (MCD) – I promised in my last article that there is always a funny story about the McDonalds dividend increase. And this year did not disappoint. Lanny and I were talking on the phone about something. Out of nowhere, he exclaimed “Oh man, we forgot about the McDonalds dividend increase that was supposed to be announced today!” He was driving, so I opened up my laptop quickly. I had to pause for second, because the last thing I was expecting was to receive a 15% dividend increase! Man, every year this is a fun and exciting dividend announcement. Company #3: Microsoft Corporation (MSFT) – Sure, a 9.5% dividend increase is pretty solid. But the amount was below their 13% five-year dividend growth rate that the company had entering the month. Mad it would have been nice if the company could have rounded it up to 10%! Company #4: Verizon Corporation (VZ) – This telecom giant should increase their dividend in the first part of the month. The increases have not been that large, but neither are their arch-rival AT&T. VZ is a classic high-yielding, low dividend growth rate stock. Company #5: Philip Morris International (PM) – I went out on a limb on this on and unfortunately, I was wrong. Earlier in the quarter, Altria Group announced their second dividend increase of the year. So I figured their competitor would follow suit. Unfortunately though, PM did not announce a second dividend increase. Darn! Bonus Company #1: JP Morgan Chase (JPM) – In July, there were a ton of bank stocks that announced a dividend increase. A lot of them were smaller in name. Finally though, in September, one of the big banks announced a HUGE dividend increase. JPM increased their quarterly dividend payment by 43%! You read that right, 43%. Just an incredible growth rate for shareholders. Congrats! Bonus Company #2: Realty Income (O) – One of our favorite sayings on this blog is that every dollar counts. It is something we live and breathe by here because we truly believe it. In this case, Realty Income’s may be small; however, over time, they add up. This month, Realty Income increased their monthly dividend from $.220/share to $.221/share. Again, a small increase. However, their dividend was $.213/share as of 12/31/17. So as you can see, all of these small increases are really starting to add up! Bonus Company #3: Texas Instruments (TXN) – TXN isn’t a Dividend Aristocrat and we don’t own shares in the company, so that is how they fell through the cracks in my last article. I’m sorry I missed it, because TXN increased their dividend 24%! With the past behind us, it is time to look forward. Man those were some awesome dividend increases in September. Let’s see if the 2018 trend will continue. Here are the companies expected to announce a dividend increase in October! Company #1: VFC Corp (VFC) – Let’s start this listing off with a Dividend Aristocrat! VFC has been on a tear this year and is up over 20% YTD! The company’s 5-year dividend growth rate is over 16%. Based on the company’s performance and the impact of tax reform, I wouldn’t be shocked to see a greater than average dividend increase this year! Company #2: American Electric Power (AEP) – A massive electric utility headquartered in the Buckeye State. While the company has been paying a dividend since the early 1900s, the company has only increased their dividend annually since 2010. Over the last five years, AEP has an average dividend growth rate of 5.25%. I would expect the company’s increase to be in line with their recent history. Company #3: Aflac Corporation (AFL) – This Dividend Aristocrat already announced a massive dividend increase in January. Man I remember how excited Lanny and I were to read about this like it was yesterday. It turns out, that was one of many great dividend increases announced during the year. Now I wonder inf AFL will get back on track and announce their ordinary dividend increase in October. Or, did the company change the month they plan to increase their dividend from October to January? I guess we will find out shortly. Company #4: WestRock Co (WRK) – Lanny and I both initiated positions in this company in the third quarter. I knew the dividend was set to increase in the given months at the time of purchase, but it is astonishing how quickly that month arrived. Man has time flown this year! WRK will increase their dividend either the last week of October or the beginning of November, so keep your fingers that it arrives this month. Last year’s increase was 7.5%, so I’m hoping the increase will AT LEAST be that this year. Company #5: Eaton Vance Corp (EV) – While I am a shareholder of EV’s competitor, TROW, I am always interested in following companies in the Asset Management industry. EV is a Dividend Aristocrat, a huge plus. EV increased their dividend 10% last year and I wonder if the company will surprise us all. Five companies are expected to announce an increase and I can’t wait to see the results start to trickle in during the month. It is crazy to see the impact that all of these dividend increases are having on our portfolios and dividend income summaries. If you want proof, check out the growth rates posted in our last dividend income from YOU the blogger articles. Comment after comment highlighted the fact that people are doing amazing things and the results are real. Hopefully this month will be as successful as the last! What did you think of the dividend increases announced last month? How many did you receive? 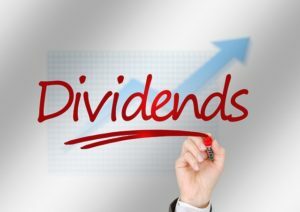 Did you receive any other dividend increases that weren’t listed above? Are you expecting any additional dividend increases that I left out of this article? This entry was posted in Monthly Summary and tagged Dividend Growth Rate, dividend increases, Investing, McDonalds, Stocks. Bookmark the permalink. Honeywell just increased their dividend by a healthy percentage. I currently have 60 share but an interested in adding another 40 to that. I saw that this morning! That was a nice dividend increase and man, with 60 shares, that is one heck of a bump up and increase to your dividend income! That’s a lot of expected increases. I for one am looking forward to both MCD and O as I own both companies. I certainly can’t argue with the 15% increase from MCD. Some nice dividend increases! I’m especially surprised by the massive increase of TXN. It’s one of the companies that’s high on my watchlist. Yeah that TXN dividend increase caught me by surprise as well. Are you looking to buy now that you know about the increase? Or are you still waiting for a better valuation? Well, a lower stock price is always better of course, but I think TXN is valued rather attractively at the moment. Wouldn’t mind buying at these prices. I received a dividend increase from O and WPC this month. I’m expecting dividend increases from EPD and EQM with a possible wild card increase from a utility that I own. Kody – Some nice REIT dividend increases right there for you. Any guesses or expectations for what the dividend increases are going to be this month?? I was able to enjoy the Sept. raises from O & TXN as you guys mentioned, and one from WPC. WPC was a small one like O, but every little bit adds up. As for October, from your list, I’m looking forward to VFC and AFL raises. I also plan to see ones from RPM, OZK and CCI. I think there’s a chance to get something from ABBV and V as well, although that’s more difficult to predict given they delivered raises less than one year ago. In any case, there’s the potential for October to be another impressive month for dividend raises! Looks like you are going to be in for an exciting month. How sick would it be if VFC and AFL increased their dividend again? It wouldn’t be the first time this year great dividend stocks increased their dividend twice in a year. Although I was disappointed about PM not following MO’s lead. I’m honestly so excited for the VFC dividend increase, so so curious. Reading the list of last months increases it really goes to show that owning solid companies rewards you so much over time. LMT, MCD and MSFT are such solid companies and they keep rewarding shareholders more and more, I wish I owned a piece of those companies already… Thanks for compiling the list again guys, great stuff! VFC should be an interesting one. I’m stumped this year and it is so hard to predict when a company woll have a strong dividend increase or a small one. I only own one of the three you mentioned and I wish I would have purchased them 5 years ago. If they ever drop in price, I’ll swoop them up in a heartbeat. All I got to say is: Long MCD, MSFT, VZ, O, and VFC of this list. Keep opening those flood gates. Dang, what a great collection of raises! Isn’t it great when the companies we invest in reward us like this? I enjoyed four raises in September and OGE did come through for me with a raise just below 10% like MSFT.